In this test, we recorded the average response time with a sustained load of 50 users (see methodology section below for details). In this test we steadily increased the number of users and observed when the site experienced the first error. "Error" is defined as either a server error (e.g., 500 error) or a response time of 20 seconds or more. The duration of the test was one minute. The test results indicate that Everleap outperformed the other hosts and plans included in the tests, in both speed of response and in ability to maintain a high traffic load. The response time tests showed that a maintained load of 50 connections had an average response time of 0.53 seconds on Everleap running on three servers, 1.20 seconds on two servers and 2.52 seconds running on a single server. 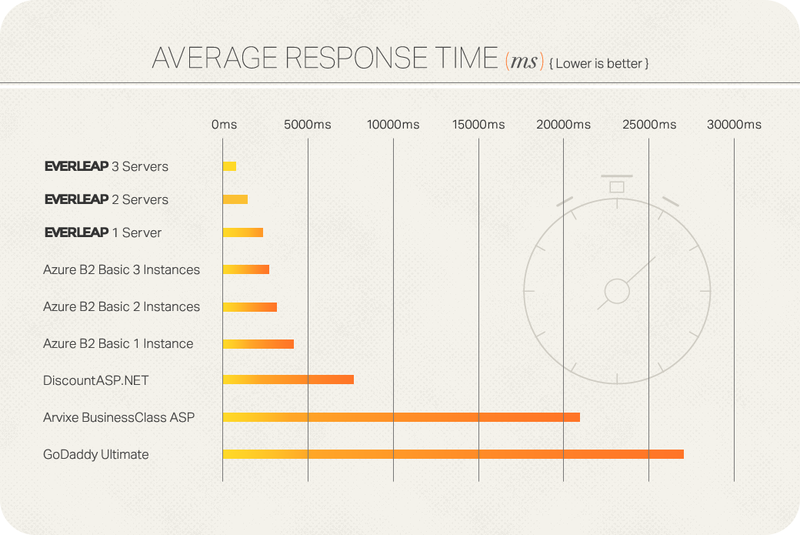 Azure Basic B2 Service Plan ranged from 2.8 to 4.3 seconds depending on the number of instances. Under the same load, GoDaddy Ultimate and Arvixe BusinessClass ASP had average response times of 26.43 seconds and 20.32 seconds respectively (which would be classified as errors in the First Fail Test). 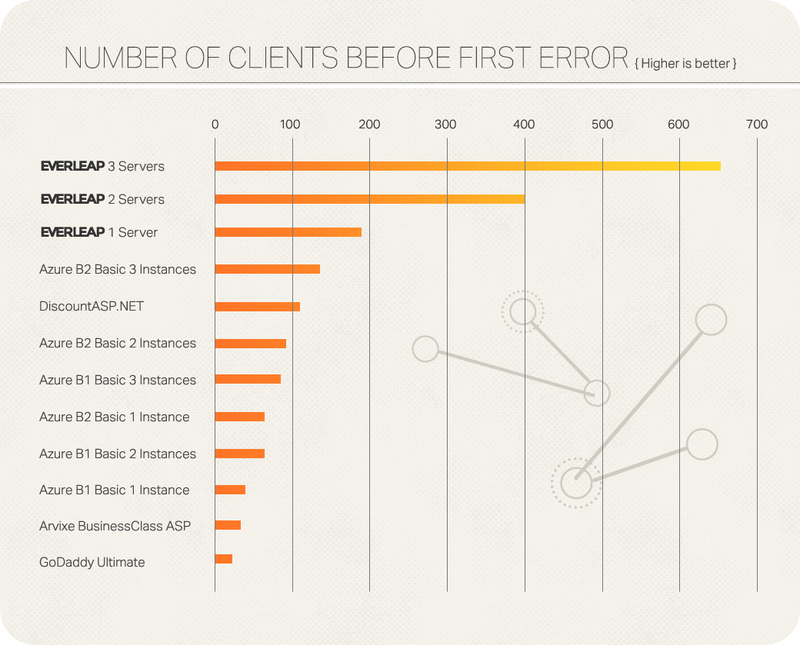 In the First Fail tests, Everleap running on a single server outperformed all other tested hosts/plans. When Everleap was increased to three servers, the test site accommodated five times more traffic than three instances on Azure Basic B2 Plan, and 18 to 32 times more traffic than Arvixe and GoDaddy respectively. Start a 30 day free trial of Everleap today. For the tests we used identical installations of a nopCommerce v3.5 demo store site. Databases were SQL Web Edition and Azure SQL Database. We used the database that was provided with or available to the hosting plan. SQL 2014 was not available at every host, so for the sake of consistency we used SQL 2012 for all test installations. Individual plan details are provided at the bottom of this page. Before testing we eliminated the latency associated with the first request for a cold ASP.NET site by loading the site so it compiled prior to running the tests. Several load tests were performed on each installation, outlier data was discarded, and the results were averaged. When possible we contacted technical support to ask about any possible methods to improve performance, providing an opportunity for the host to make any configuration changes they were capable of offering a hosting customer on the given plan. If configuration changes were made, clearly explained and replicable, we re-ran the test. The load testing was performed using loader.io from April to June, 2015. They were "maintain load" tests, where a specified number of users made requests to the site home page with a one second ramp-up (the chart at the link shows a 20 second ramp-up). After receiving a response, each user makes another request. If you have any questions about these test results, let us know, we'll be happy to answer them. Modern hosting for today's developer. All rights reserved. All trademarks are property of their legal owners.